Love and Happiness: Zealandia - part of Mu? Zealandia - part of Mu? This was on the news this past week. New Zealand is part of a sunken continent. Lemuria? New Zealand might be sitting on a continent we didn't even know existed, scientists say. In a new study, a team of 11 geologists, including from GNS Science, have argued New Zealand and New Caledonia aren't actually a series of islands - but rather part of one 4.9m square kilometre continent called 'Zealandia'. "Zealandia illustrates that the large and the obvious in natural science can be overlooked," the researchers said in article published in GSA Today. Scientists have for decades thought the region was a series of partly submerged and broken up "continental fragments". 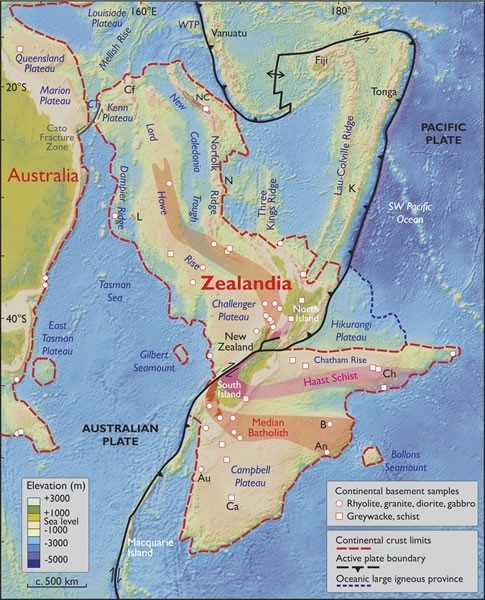 But using modern satellite technology and maps of the seafloor, the researchers have concluded Zealandia is actually not as broken up as once thought and should be listed as one continuous continent next to the other seven. The data suggests the continent is actually larger than greater India. "If the elevation of Earth's solid surface had first been mapped in the same way as those of Mars and Venus - which lack the arbitrary datums of opaque liquid oceans - we contend that Zealandia would, much earlier, have been investigated and identified as one of Earth's continents," they wrote. "This is not a sudden discovery but a gradual realisation; as recently as 10 years ago we would not have had the accumulated data or confidence in interpretation to write this paper." The scientists said classifying the area as one continent wasn't just a matter of putting "an extra name on a list". "That a continent can be so submerged yet unfragmented makes it a useful and thought-provoking geodynamic end member in exploring the cohesion and break-up of continental crust."